Nouba - Magic Powder - 390 - 18Volatile translucent finishing powder, impalpable and magical. The complexion will be smooth, illuminated and your make up will be fixed for the whole day. Its light and silky film will not be felt on the skin. 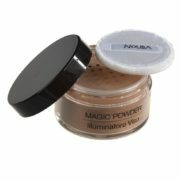 Volatile matting powder for a flawless finish. Perfect to fix the make up. Recommended for photo ready makeup. Enriched with micronized pigments and spherical powders for a flawless film. Jojoba oil is known for its soothing and softening properties. The soft focus complex minimizes optically the skin imperfections. The special lamellar particles provide a unique, smooth and silky feeling, as well as a fabulous illuminating effect on the skin. Buff the product on the face with the sponge. Remove the excess with a kabuki brush.